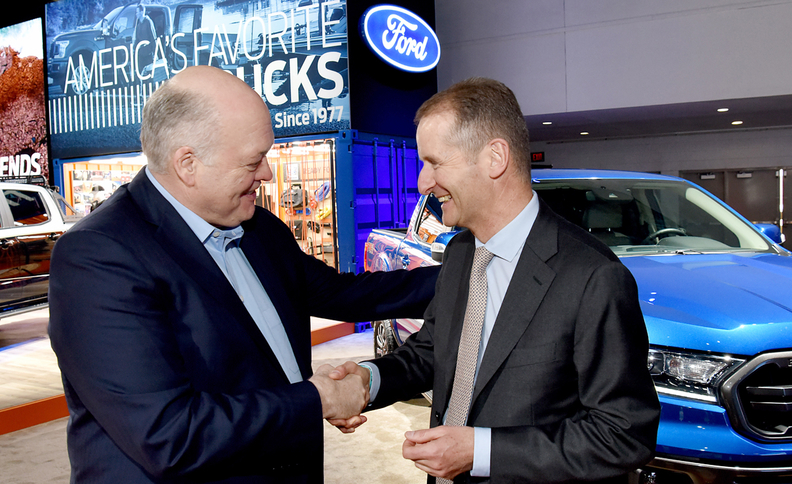 Ford CEO Jim Hackett and VW CEO Herbert Diess met at Ford's stand at the Detroit auto show. DETROIT — Ford Motor Co. and Volkswagen Group on Tuesday said they will collaborate on commercial vans and midsize pickups, and are exploring the joint development of autonomous and electric vehicles as part of a broad partnership designed to save both companies hundreds of millions of dollars. The global alliance comes as both automakers attempt to shore up their business in overseas markets and navigate rising costs associated with emerging technologies. Both sides have been talking since at least June. As part of the alliance, Ford will develop midsize pickups and large commercial vans for both companies as early as 2022. The midsize pickup will be based off Ford's global Ranger and will be produced for the South American, African and European markets only. The large van will be based off Ford's Transit Custom, which is not sold in North America, and will be built for the European market. Volkswagen intends to develop and build a city van for both automakers. Hackett declined to say what plants the companies will utilize, while Diess said it’s possible vans could be built in Ford's plant in Turkey. The companies both said they’re open to working on additional vehicle programs. Jim Farley, Ford’s president of global markets, said the automaker expects $500 million in ongoing annual pretax benefits from the pickup and van collaboration, while Diess said VW expects similar savings. The companies estimate the cooperation will yield improved annual pretax operating results starting in 2023. The two sides also signed a memorandum of understanding "to investigate collaboration on autonomous vehicles, mobility services and electric vehicles." Diess said the automakers are looking at combining their autonomous vehicle development, including Ford-owned Argo AI, as well as VW research groups in Wolfsburg and Munich. On the EV side, Ford is looking to utilize VW’s MEB platform. It’s unclear how, if at all, the companies’ workforces in the United States would be affected. Hackett declined to comment on any shuffling of jobs. The UAW has been trying to organized VW's plant in Chattanooga since 2011. Jessica Caldwell, Edmunds executive director of industry analysis, said there are major long-term implications at stake for both automakers. "Automakers aren’t just competing with each other anymore, they’re under intense pressure from well-funded tech companies who are eager to get in on the future of mobility," she said in an emailed statement. "Cutting costs by sharing vehicle architectures and manufacturing facilities is just table stakes in this new world, and is a nice place to start. However, the key to success will be if Ford and VW can help each other fend off the upstarts and become leading forces in electric and autonomous vehicle technology."